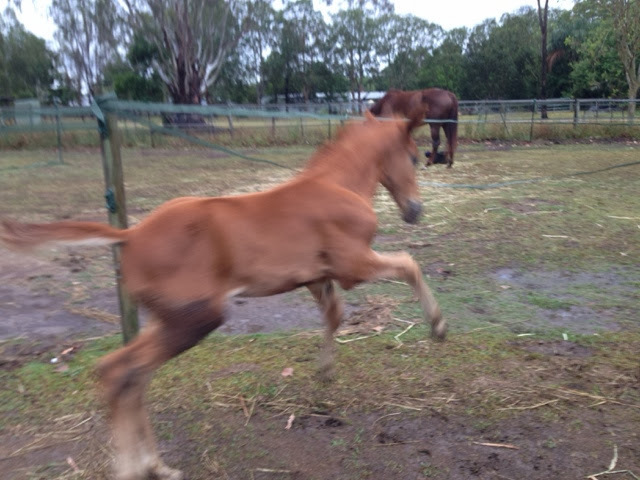 Boutique agistment next to the Burpengary Equestrian Centre, BEC, in Burpengary 4505, about 35km North of Brisbane. DoubleDutchSportHorses also breeds warmblood horses. Over the last year we have worked on improving the horses shelters. To improve drainage we raised the floors and placed rubber matting. Soil behind the stables was removed, resloped and reseeded with grass. New automatic waterers were installed. The last jobs will be installing additional lightning and planting shade trees. Now the ground works are finished our fourth agistment paddock will be available from March 2018. Both mares were due early October but decided that receiving apples multiple times each night (during checks) was well worth holding on to the bubs a bit longer. 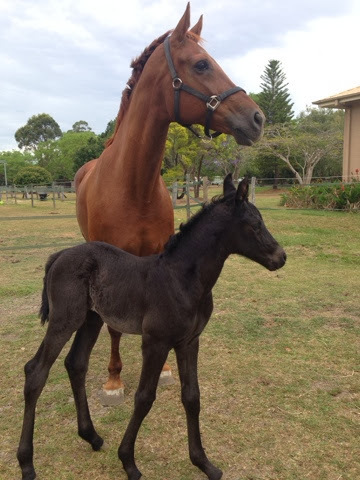 But the happy day arrived and Fatima foaled a beautiful all black filly. Miss Loxley was born 15/10. All went well and mother and daughter quickly recovered. It was a terribly cold night so Missy got introduced to being rugged straight away using an old dog rug. 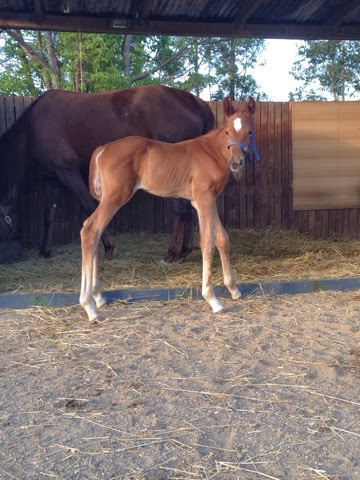 40 hours later, Dot also foaled at a very reasonable time of 2030. 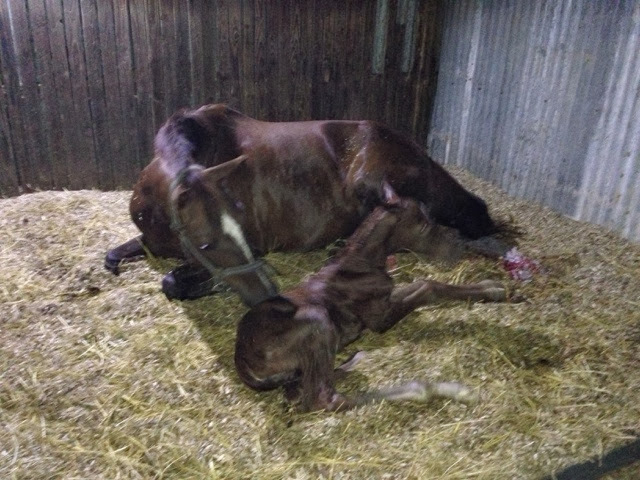 It was a bit difficult but a long legged chestnut filly came into the world. Dot was obviously sore and not overly sure what to with her foal but she let it suckle. The motherly feeling developed in the following days. 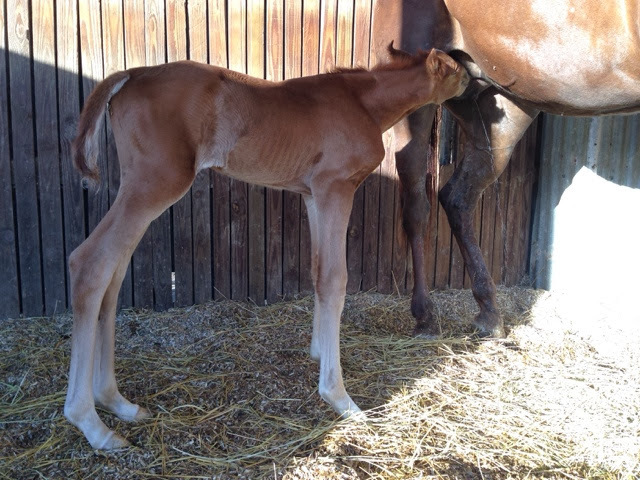 Unfortunately the foal had problems passing meconium (first manure) and had to be treated in the vet hospital. After returning from the vets, she developed an umbilical cord infection and had to go back to the vets for four daily injections. Poor baby! She recovered quickly and has come home. We named her Dyonah. Below some photos of my kids. Foal season has arrived. It's an exiting as well as nerve wracking time of the year. This year we are expecting two foals with exiting bloodlines. 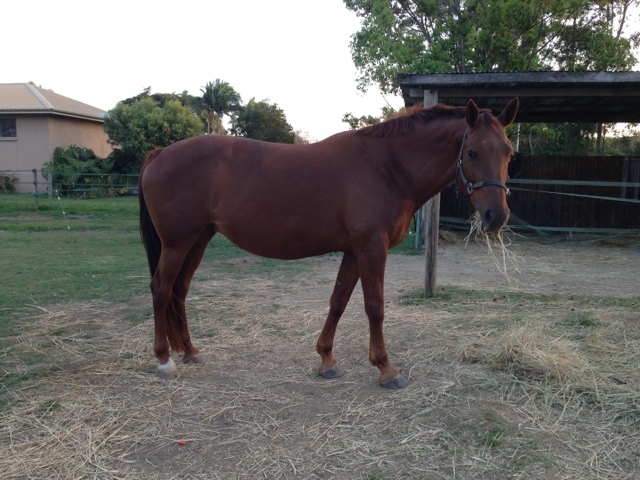 The first one will be a Dutch warmblood out of imported Dutch mare Fatima (sire Cabochon). The sire is the imported German stallion Legend of Loxley. 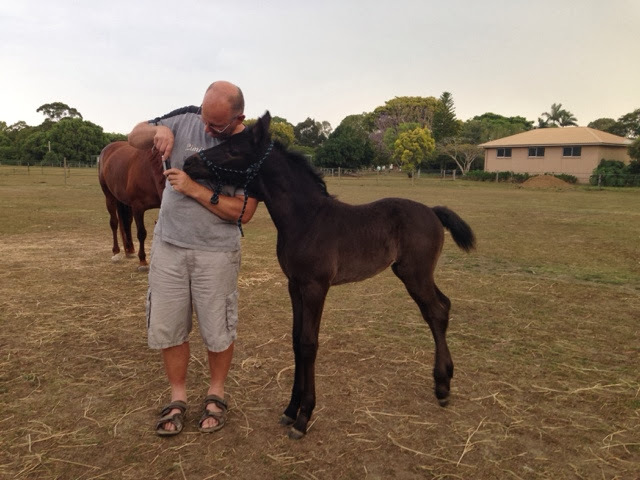 The second foal will a Hanoverian. 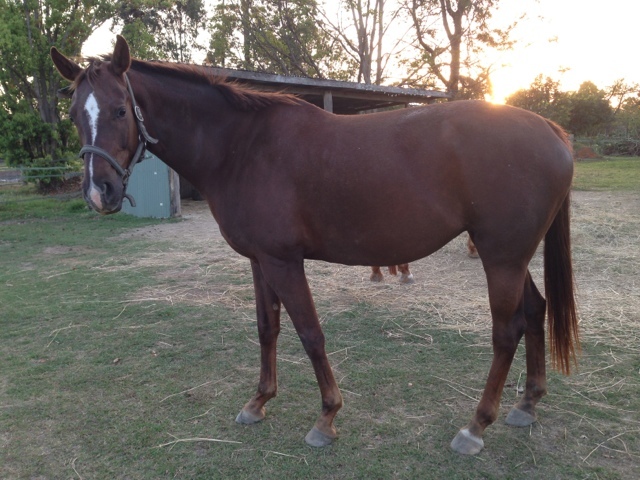 This one is out of Serenity (sire Sir Donnerhall). The sire is Dr Doolittle, an excellent stallion from zuchthof Klatte in Germany. Both mares are due early October so sleepless nights on foal watch will be starting soon. 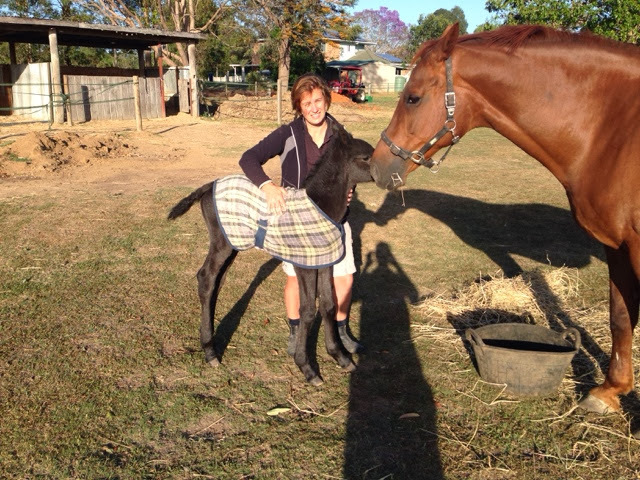 Fingers crossed that all will go well and we get two healthy foals with healthy mums. The rains of the last days put an end to a long dry spell. Although extreme with the creek flood gauge peaking at 19 meter, the rainfall last week only caused some ankle deep flood water over 2 of our paddocks. Also the floor of one of the shelters got just wet. It did not even reach the hay bales. The soil finally got a good drenching. Already we see the grass turning green. The horses will be very happy over the next weeks as they finally will have grass to graze. Some agistees told us recently that they - reluctantly - have to move on. Life priorities at times unfortunately overrule our hobbies. We wish them and their horses all the luck and happiness possible. Too bad to see them leave, but it will give others the opportunity to move in. So if you are interested, give us a call. More details about agisting with us can be found on our agistment page. We did not update the blog for a long time. Too many other things to do and our group of agistees remained quite stable. Still it i might be worthwhile to report some main events for future reference. 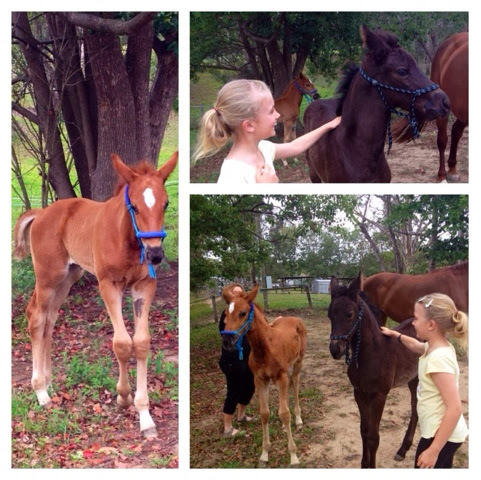 The low point of last year was that Fatima lost her foal due to a premature birth. We will address this in a separate post. There might be some pointers for others to be aware of the sign of placentitis. A better event last year, though a lot of work, was improving the soil in the lane way and under the shelters. First we had the top 30 cm soil in front of the sheds and under the shelters dug out. This soil was used to fill some gullies in the paddocks. Thereafter we spread geotextile on the ground and placed a layer of 20 cm shale. Saskia compacted this with a vibrating roller. As top layer 10 cm of deco (crushed granite) was spread around and again compacted. In all it took 5 combinations (truck and dog) to bring the shale and deco that we needed. In the heavy rains of last summer the shelters still got a bit wet, but generally there was a huge improvement over the previous years. As so many, we were inundated by the flash flood Tuesday. As it was a 1 in 800 years rain event it is very unlikely we will see anything like this again in our lifetime. Fortunately everything is ok with the horses and us. The horses were not even phased, they rather had a lot of fun playing in the water. The water was at an historic extremely high level. It can't get any higher as this as the flow of water will just get wider. We moved the horses to high ground around the house, but they decided it was more fun to play in the water. They went into deeper water at about belly deep and played with the neighbor's dog (a Great Dane) who swam around them. They had a great time! Some hours later all water was gone and the horses went back to grazing. Now they are feasting on an endless supply of partly wet hay. The agistee shelters had some water in them, but we had been in time to put the saddles high and dry. Some feed was lost and there was a lot of mud. The sheds are cleaned already, one by our agistee and her family (thanks). Our hay (garden)shed is emptied, the wet bales were getting hot already. All considering, we have been very lucky. The horses are fine, and the house only just started to flood in this 1 in 800 year event.. The water just started to seep into the house .. when the water retreated. Still all carpets had to be removed. But the rest of the damage appears very limited. Nothing compared to what many others have to cope with. The BEC took a lot more water, the indoor inundated, barrels and water tanks floated away.